Whatever you call it or whether or not a cartoon orange creature is on the bag, this a classic beloved snack. 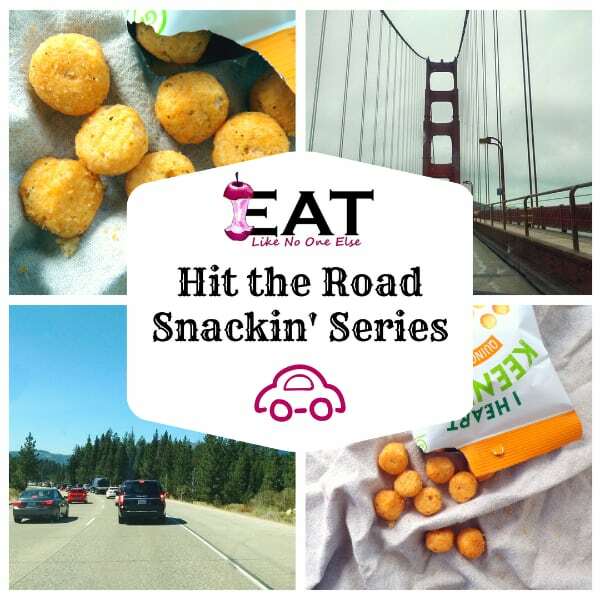 I am sure many of us have had these finger staining snacks many times on a long road trip. The kids get out of the car with their clothes decorated in neon orange crumbs – a parent’s nightmare. 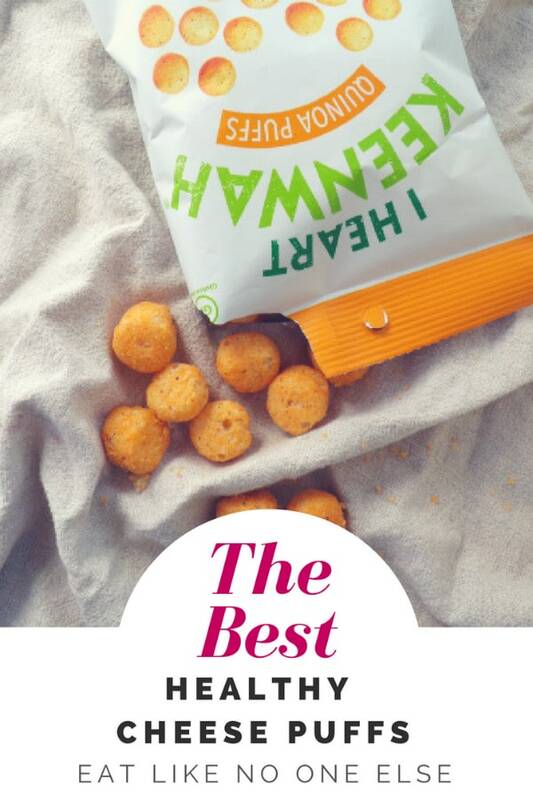 Today as part of our summer series “Hit the Road Snackin‘”, I want to share a great way to enjoy a cheese snack in ball form, that won’t stain your hands and clothes, tastes great, and get this; contains super healthy quinoa. This is some serious snacking I can get behind. Right amount of cheddar flavor. What is a Quinoa Puff? So what is exactly are these quinoa puffs? They resemble a classic cheese puff in look and texture. They are made of quinoa flour, brown rice flour, white rice flour, pea protein, and baking powder. The oil they use is High Oleic Sunflower oil, which is high in monounsaturated fat. 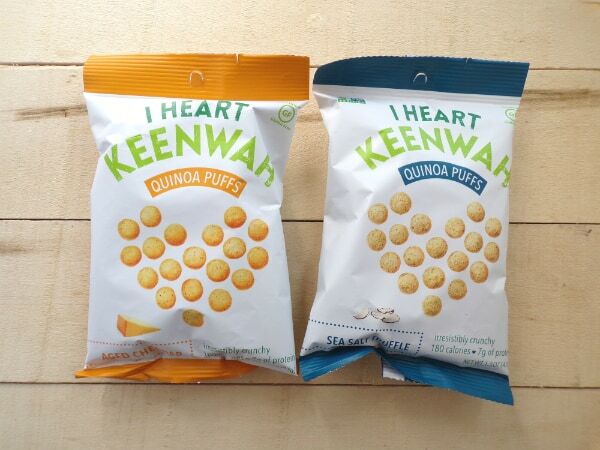 I Heart Keenwah has several flavors of quinoa puffs, my fav has to be the the Aged Cheddar Quinoa Puffs. These puffs contain legit cheddar; none of that fake cheese flavor that you get a lot of time with various cheese snacks. I find alot of cheese snacks and crackers are overwhelmed with onion powder to kind of make up for the lack of flavor (either that or the onion industry is blackmailing the cracker industry). The texture is as good as any other cheese puff or ball or whatever you want to call them. The puffs are crispy and light. Yet they don’t just melt in your mouth, like those baby food puffs are meant to do. No immediate absolute disintegration in my mouth. 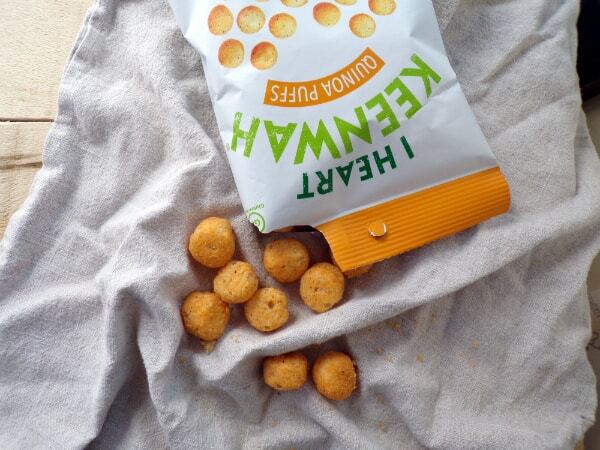 I Heart Keenwah Aged Cheddar Puffs are baked not fried, and gluten free. What is So Good About Quinoa? It’s the protein. Quinoa contains that wonderful protein that people are telling us we should be eating all the time. Quinoa is high in fiber and full of vitamins and minerals. All things you are not going to get from the cheese puffs made with cornmeal that is stripped of so many nutrients than they have to enrich it/add them back in. Who is I Heart Keenwah? 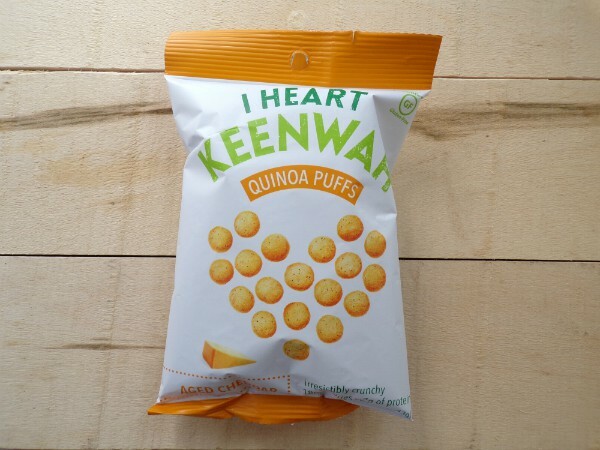 If you have ever struggled to pronounce quinoa, then “I Heart Keenwah” is here to save you from further embarrassment. They spell their company name – Keenwah just as you should say – quinoa. What a helpful bunch! Besides helping us not look like a fool, I Heart Keenwah is helping those that grow their quinoa. I Heart Keenwah uses fair trade certified quinoa from Bolivian. The variety they use is called Bolivian Royal Quinoa – an heirloom variety that been passed down. It has not been hybridized or genetically modified. Each year the growers set aside 10% of the harvest to re-plant the following season. Bolivian Royal Quinoa is perfectly adapted to their growing region. Bolivian Royal Quinoa is larger in size than commercial quinoa varieties. It cooks up fluffier. I had some of I Heart Keenwah’s toasted quinoa and it was the best quinoa I ever had. I ended up with something fluffy and not gummy. This is the same quality quinoa you will find in their puffs. I Heart Keenwah Puffs come in 4 different flavors – Aged Cheddar and Sea Salt Truffle pictured here as well as Sweet Chili, and Herbs de Provence. I Heart Keenwah started out as a class project. Our co-founders Sarah Chalos and Ravi Jolly were classmates at Booth Chicago Business School, and one of their projects was to come up with a product line and create a plan to bring it to market. Ravi had just visited Bolivia, and was fascinated with all the creative ways they were using quinoa there. Meanwhile in the States, quinoa was still very much unknown, and really only sold in health food stores. They actually made samples of our Quinoa Clusters and brought them into class for everyone to try. They spent the next year or two making small batches at home and selling them at farmers markets until eventually they had some professional packaging made up and started selling into retail stores. A few years later, Sarah and Ravi were curious to see if quinoa could be used as a nutritious alternative to corn in puffed snacks – like Cheetos. After a lot of trial and error they found a way to extrude and bake little puffed balls of quinoa flour (and other ingredients) to make Quinoa Puffs. One of the best things you can do if you are traveling with kids is to get a family membership at your local hands on or science museum. If the museum belongs to the ASTC, then you can get free or discounted admission to science centers across the country. We used this pass at so many museums. They make the perfect get out of the van and have a break stop that you already have paid for. 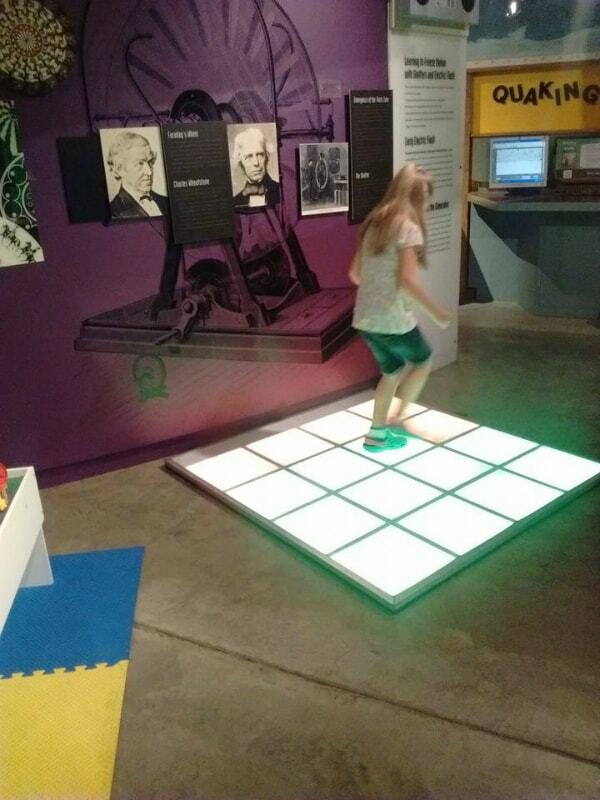 One particularly very long day crossing Nebraska, the kids didn’t need a break so we hit up this museum in Aurora, Nebraska, My kids totally needed to jump around on light up floors to burn off some energy.